YOU WONT NEED THE LUCK OF THE IRISH! Now through March 17, 2019, we have over 100 Cars on Clearance! 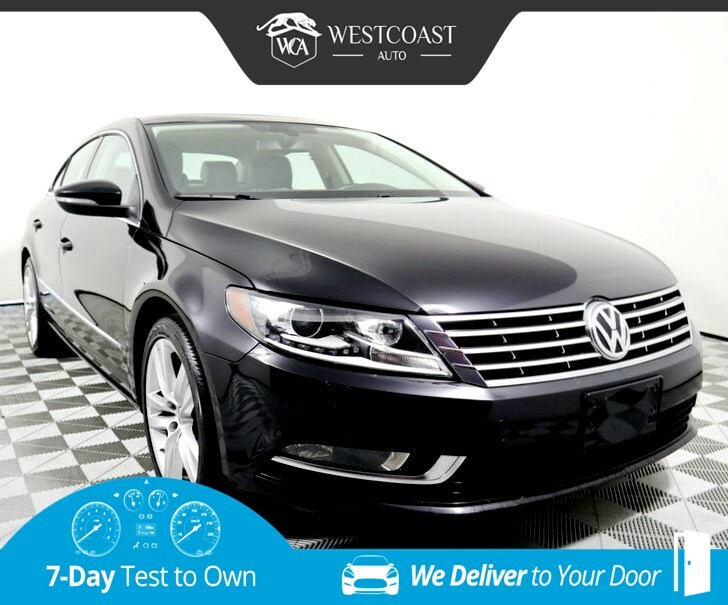 Masterfully designed to be an ideal traveling companion, our superb One Owner, Clean CarFax 2014 Volkswagen CC 2.0T Executive Sedan is shown in Deep Black Metallic over Two Tone interior. Motivated by a 2.0 LIter 4 Cylinder that churns out 200hp while tethered to a 6 Speed Automatic transmission with Tiptronic and Sport Mode. This Front Wheel Drive provides a smooth ride and brilliant driving dynamics. Our CC 2.0T Executive's beautiful coupe-like silhouette is accented by advanced Bi-Xenon HID headlights, stylish LED tail lights, alloy wheels, and a power tinted-glass sunroof. The driver-centric interior of the CC Executive exudes European elegance and sporty sophistication with premium leather on heated eight-way power front seats. Touchscreen navigation system helps you find your way as you stay connected with Bluetooth phone and audio. With an eight-speaker sound system and available satellite radio with a touch-screen interface, you will certainly enjoy listening to your favorite songs as you move about town in this chic sedan. Appreciate the convenience of keyless entry/ignition and a hands-free easy-open trunk. Additionally, our new Car-Net telematics system allows you to interact with your vehicle through your phone; thus keeping track of family members driving your car, managing your vehicle health, and receiving support and assistance anytime you need it. Volkswagen engineers meticulously designed our CC 2.0T Executive with a rearview camera, stability and traction control, anti-lock disc brakes and multiple airbags to keep you out of harm's way and to provide you with peace of mind. You'll make a statement without saying a word in this intelligently designed sedan. Print this page and call us Now... We Know You Will Enjoy Your Test Drive Towards Ownership! Great quality, easy financing and affordable prices aren't the only things that make Westcoast Auto Sales the first choice of many discerning auto buyers. Stop in and See California's Dealer of the Year!